The TOTO Vespin II 1G Washlet+ S350e toilet and bidet system is top of its class in terms of both looks and features. 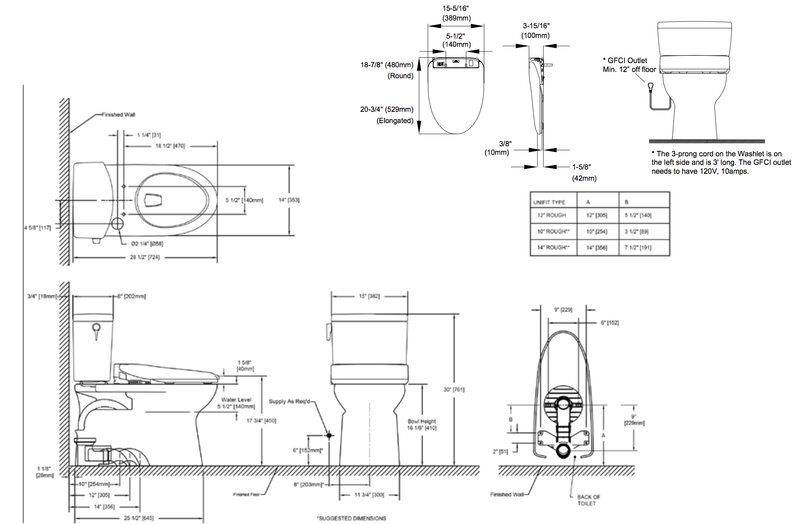 The toilet is a universal height, making it ADA compliant, and its contemporary, skirted design is easy to wipe clean. It features an ultra-efficient yet effective 1.0 gallon flush that’s powered by TOTO’s signature Tornado Flush System, and the bowl’s CeFiONtect glaze creates a slick surface that deters residue from sticking. Furthermore, this toilet and bidet system owes much of its sleek silhouette to TOTO’s design team, which cleverly engineered the Vespin II 1G to hide the cords and hoses of the S350e Washlet+ from view. That said, it’s worth mentioning that the S350e Washlet+ included in the purchase of this system is only compatible with Washlet+ TOTO toilets. TOTO’s S350e Washlet+ comes with a wide array of high-end features that will take your toileting routine to new heights of comfort and luxury. Four wash modes—front, wide front, rear and soft rear—provide an effective cleanse, and the seat’s water temperature, water pressure, seat temperature, and wand position are all adjustable according to your preferences. The oscillating spray option moves the wand back and forth for a wider, soothing cleanse, and the pulsating spray option alternates the water pressure to provide a gentle massage sensation that relaxes tender areas and stimulates the bowels. Unlike some models, the S350e comes with an instant water heater that provides unlimited warm wash water, and the warm air dryer provides a gentle drying alternative to rough and irritating toilet paper. For additional convenience, the seat’s deodorizer automatically activates when the seat is used to get rid of unpleasant odors, and the built-in nightlight gently illuminates the toilet bowl, making nighttime bathroom trips both safer and easier. The S350e’s lid automatically opens and closes when someone walks towards or away from the unit so you never have to touch the toilet itself, and two programmable user presets enable you to program your favorite wash and dry settings into the remote rather than having to manually select them each time. Last but not least, the S350e maintains a high level of unit hygiene thanks to its use of sterile, electrolyzed water (eWater+) for automatic functions like misting the bowl prior to use and rinsing the bidet’s nozzles after each use. With its attractive look and plethora of luxury features, the TOTO Vespin II 1G Washlet+ S350e toilet and bidet system is a true winner all the way around!